But if you’re the Rev from Burger Conquest, these rules and traditions have no meaning. 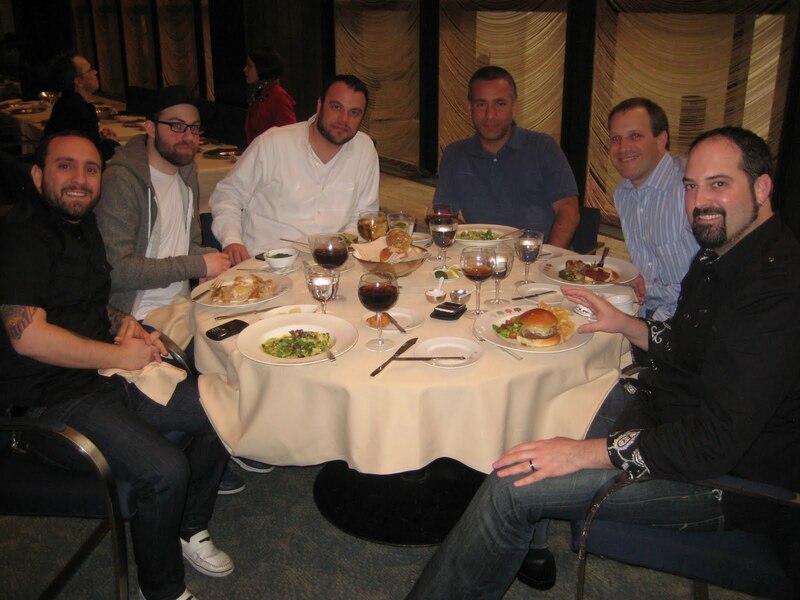 When our buddy JJ announced that he was moving to LA to become a powerful booking agent, we wanted to send him off in a proper manner with a congratulatory power lunch at the Four Seasons. For someone as “burger famous” as I am, getting a reservation was easy as pie and the jacket requirement, well…no one even mentioned it. In fact, we were immediately shown to a large table next the window with a beautiful view of 53rd st and Park Avenue. Jacketless, Mark, John G, Adam, Matt, JJ and I settled in and began to peruse their short menu. 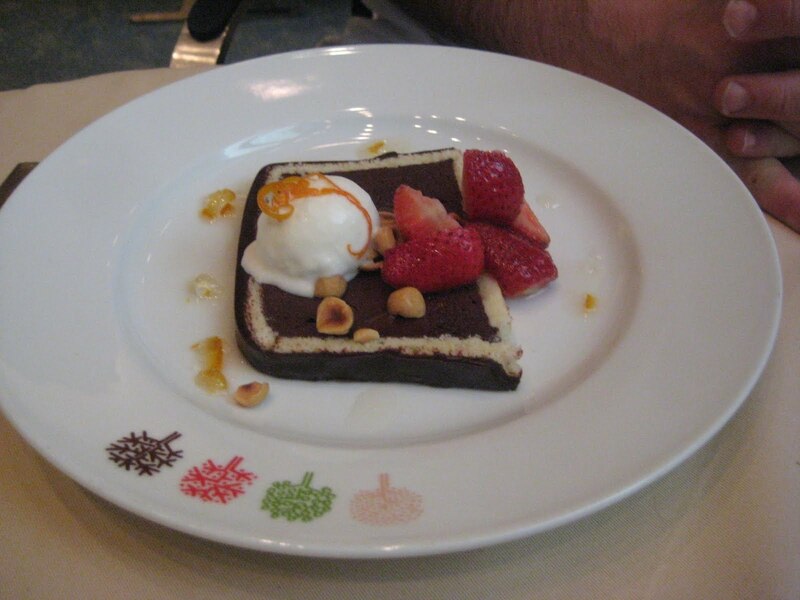 The options are pretty fancy ranging from Bison Filet to Maryland Crab Cakes to Dover Sole to Loin of Rabbit and beyond. They also have a very famous, signature $27 Sirloin Burger and even though everyone else opted out on the burger, I don’t fault them for it. 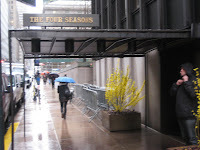 When were they going to get a chance to dine again at the Four Seasons!?!? We started off the meal sharing a plate of their Burrata cheese, one of the special appetizers of the day. It was fantastic!! 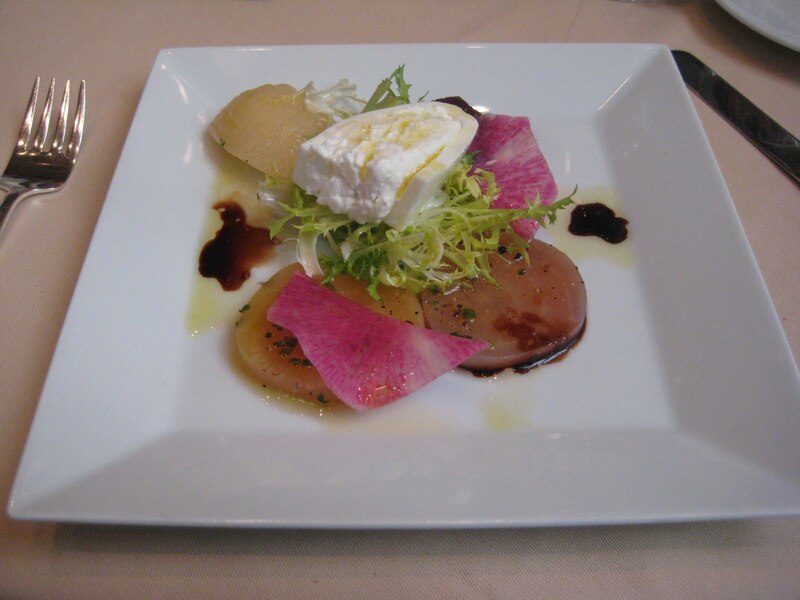 Burrata is an Italian cheese made from a mix of cream and mozzarella while the outer shell is comprised entirely of mozzarella. 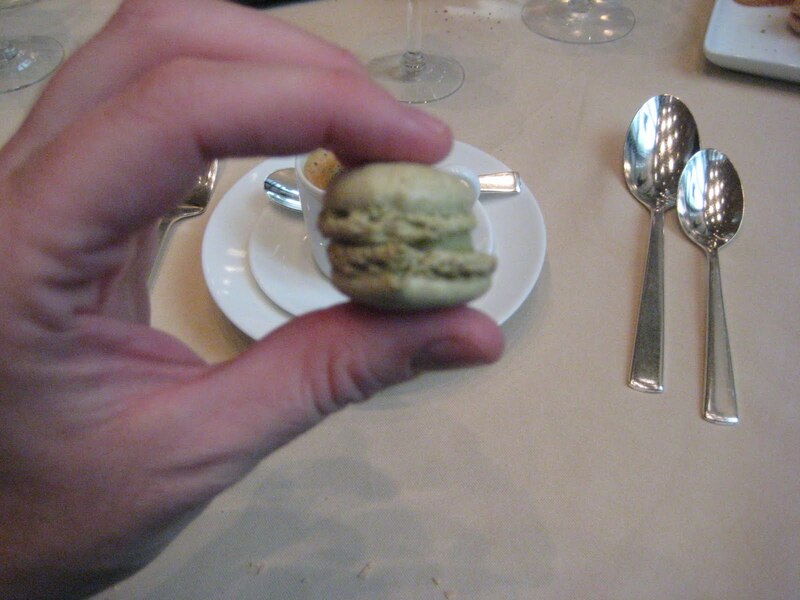 It had a light and creamy texture with a distinct flavor. The taste was not unlike mozzarella but with a more savory zeal. The beets had little to no appeal so after ate bite or two, I didn’t bother to return. 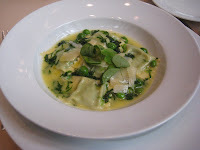 To go along with the cheese I also selected the Sweet Pea Agnolotti, Parmesan Broth. Agnolotti is a smaller kind of ravioli made with flat pasta. The sauce was buttery, cheesy and oh so savory. The sweetness of the peas made for an interesting flavor balance while the sage pulled it all together from the middle. I could’ve easily eaten a 2nd bowl but since I knew a tasty and high priced burger was coming my way, I practiced restraint. 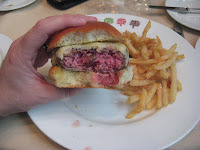 The burger was smaller than I had envisioned, easily fitting into my (not) patented “left hand grab.” I don’t want to give you the impression that it was a small burger but for a $27 gourmet burger I was imagining something the size of a NY Strip between 2 loaves of bread. A couple bites into the sandwich revealed an absolutely perfectly cooked medium-rare patty. Clearly it was prepared with precision and care. 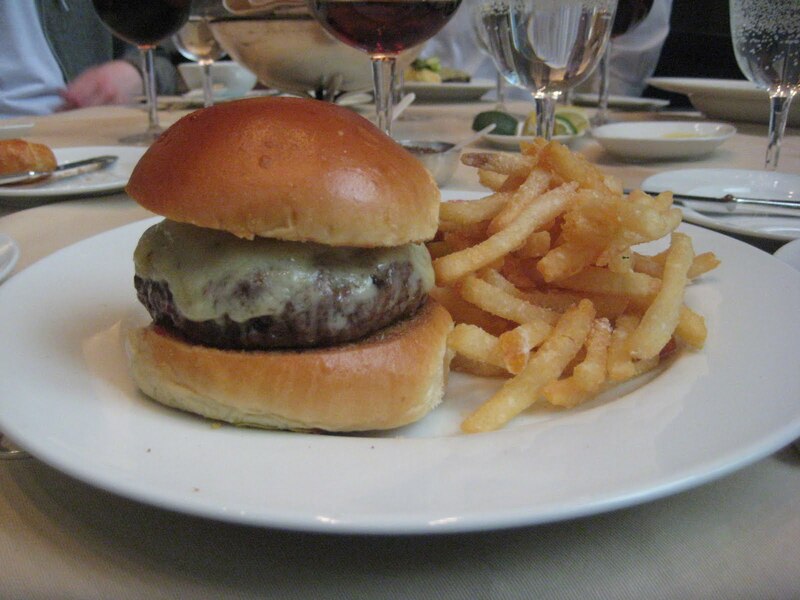 The beef was fresh and so juicy and the crunchy brioche barely contained the dripping. I ordered it topped with Wisconsin cheddar and added a little schmear of mustard. The burger came accompanied with chopped tomato, pickle and lettuce garnishes but the sandwich just had no need for any of it. Between the bun, cheese and mustard, there was already more than enough flavors packed around the quality ground beef! The french fries had a real crunchy skin and it was near impossible to stop eating them. If you are rich, famous or have you friends who are, get in on a reservation and check it out for yourself! 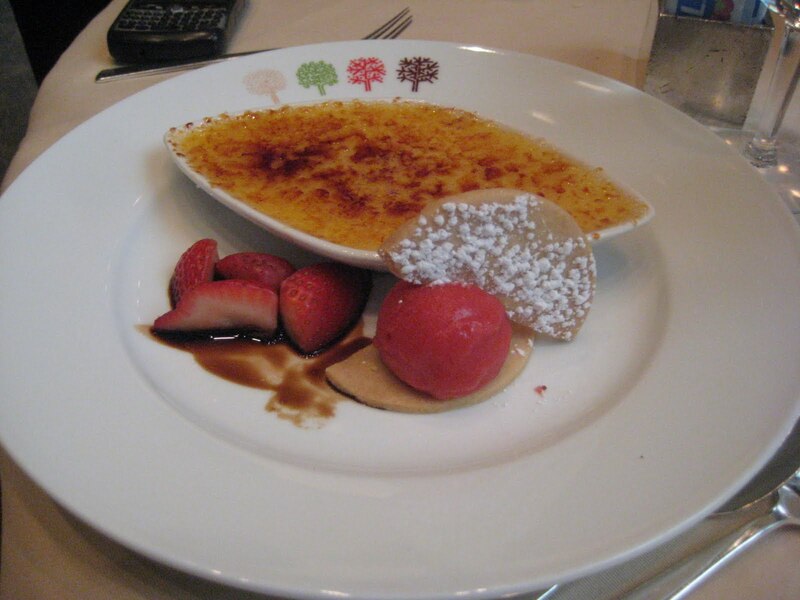 I’m not much of a person for sweets or dessert but the others are so they ordered the Vanilla Creme Brulee, the Lemon Cheese Cake and the Chocolate Velvet. 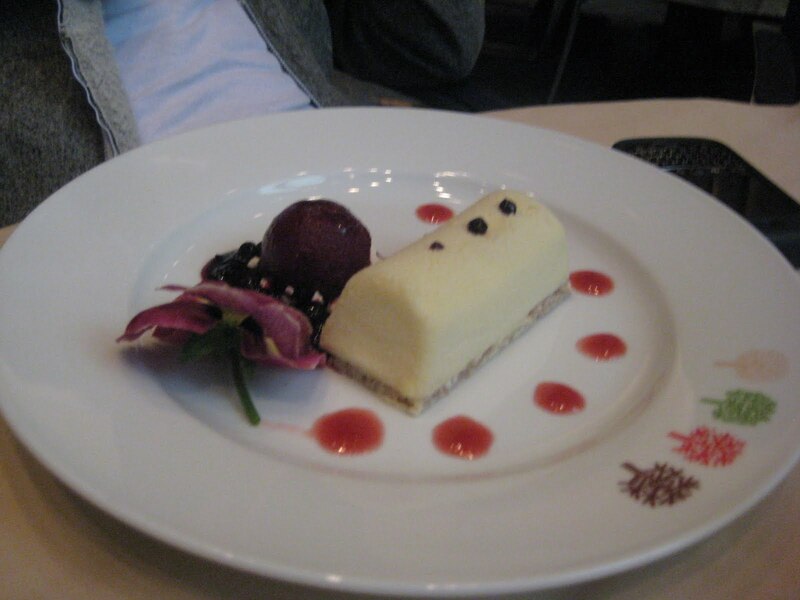 They were all good, especially the Velvet which came with Crème Fraiche Sorbet & Strawberries. 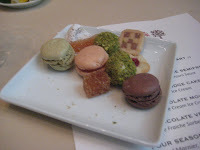 However, better than all the above was the assortment of bite sized cookies they brought us. My favorite was the Macaron, a meringue based cookie with a light flaky outside and a chewy center. Apparently they are very hard to prepare and very delicate in nature which makes them a coveted treat. But you know, its Burger Conquest, so of course they made sure we felt special. P.S. All of the statements made about my “burger fame” are true facts I made up for the sake of this story. In fact, it is entirely possible that I am an absolute nobody with a stupid opinion and silly set of blogs. Although under dressed and with tattoos, it’s not out the question that we were allowed to dine because it gave the other powerful diners a good laugh. Thankfully for you the reader, everything I said about the food is actual truth. 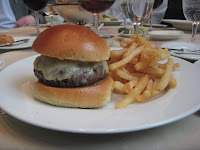 This entry was posted in Uncategorized and tagged the great burger conquest hamburger cheese french fries review new york ny nyc four seasons restaurant hotel jj going away lunch. Bookmark the permalink.